BROADMOOR . . . first in the suburbs, first with floating traction! Here's the elegant way to tame your suburban acres ... to take the time-consuming grind out of jobs that could make you long for apartment living. 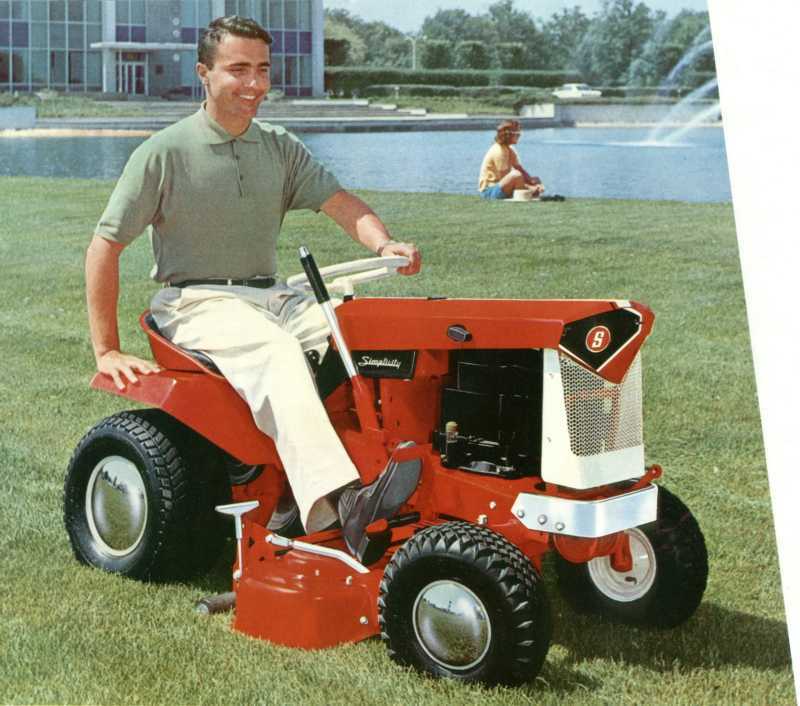 Do it with the 6 HP Simplicity Broadmoor. This is the riding tractor that rolls to work on lawn-pampering Floating Traction tires; the only mark it leaves is the mark of a job well done. It's a fact - Broadmoor's high-flotation tires exert less ground pressure per square inch than a ninety pound boy in sneakers. 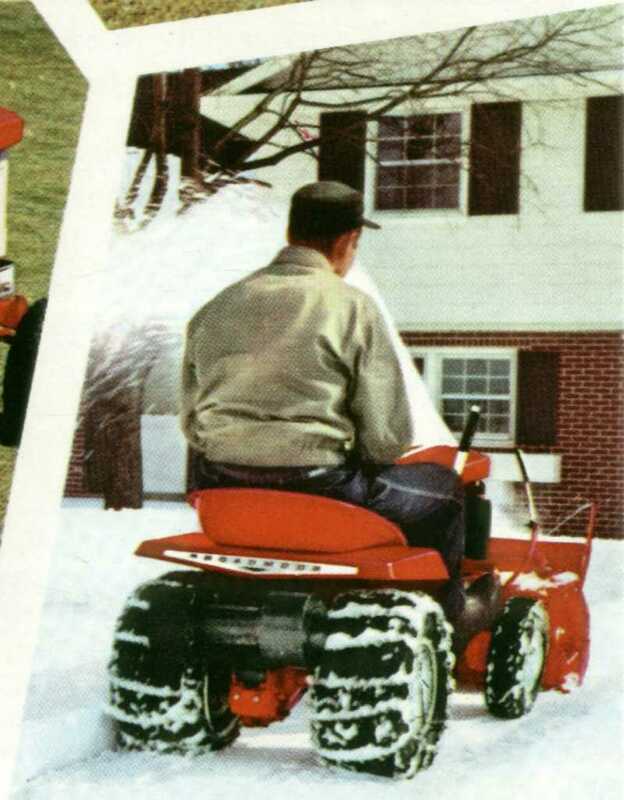 While they never mar or gouge your lawn, they provide sure-footed traction -- unfazed by slippery snow, sand or mud. Broadmoor versatility stops just short of plowing and tilling chores. 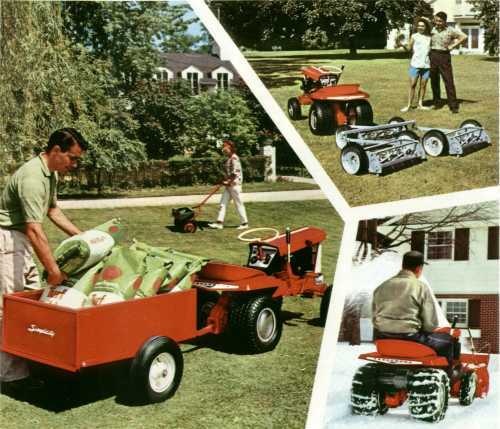 It gives you a choice of lawn-mowing options- with width of swath ranging from 32 inches to five feet. It's great for grading gravel driveways. It takes the drudgery out of snow removal. It does all this, and more, swiftly, easily. And you change attachments in less than a minute, without tools. Dependability is a basic characteristic of this all-year worker. The powerful 6 hp engine is ready to go when you are ... responds eagerly to Easy Spin starting and magneto ignition system. Carries seed, fertilizer, heavy or bulky implements ... great for dumping wastes of all kinds, too. Sturdy heavy-gauge steel body completely reinforced to haul heavy loads constantly for many years. Electrically-welded steel frame also. 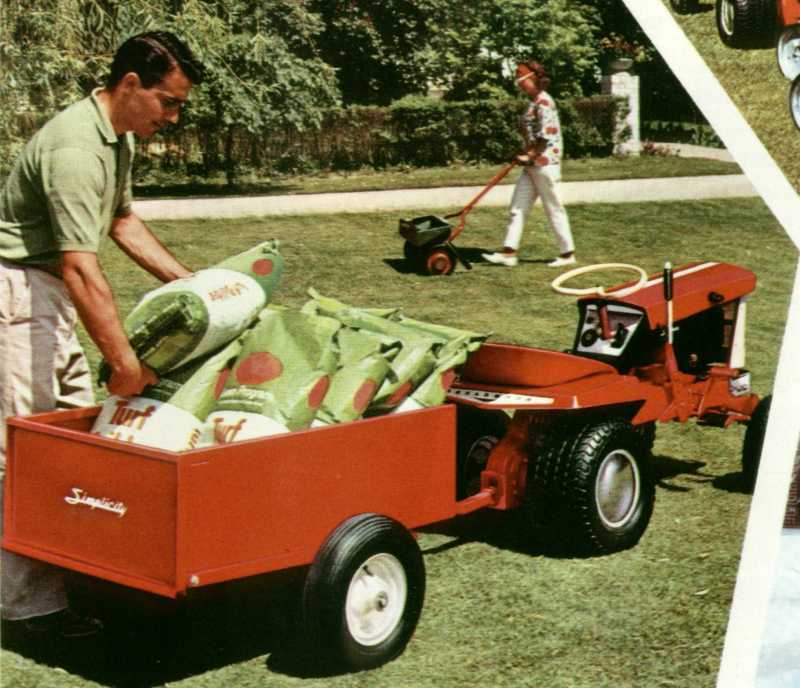 Unit can be completely tipped without disconnecting the trailer hitch or lifting the trailer wheels from the ground. Tailgate is detachable. Quick Hitching. Capacity: half-ton, Size 39" x 26" x 12". Isn't it time you declared gang warfare on that big lawn of yours? 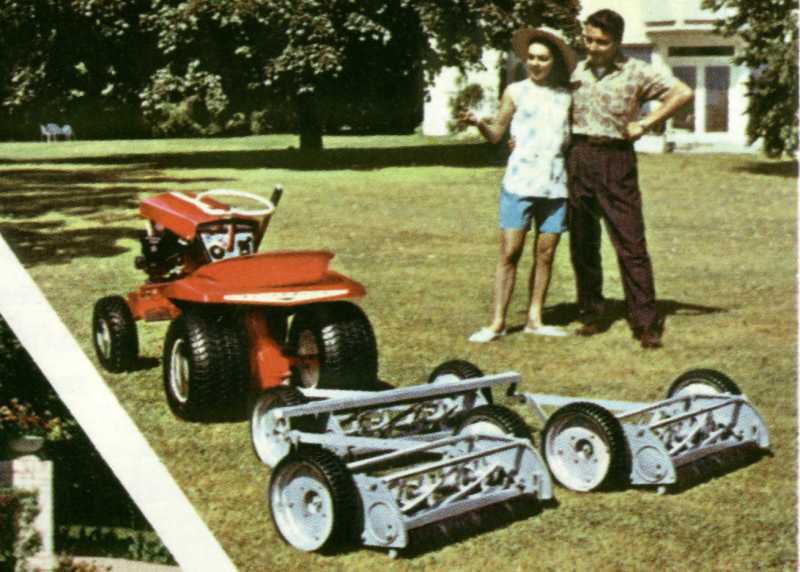 Three 22" ground-driven mowers smooth 2 ¾ acres per hour, cutting a velvety swath five feet wide. Heavy-duty construction means long, service-free life under constant service. Extra wide tires to prevent marking the lawn when ground is wet. If snow shoveling can be fun, this is it! This 32" rotary snow thrower really gets rid of snow fast. Cuts a 32 inch wide swath and sends it flying in any direction. The one-piece, non-clogging auger has an adjustable height which allows snow removal over uneven surfaces.